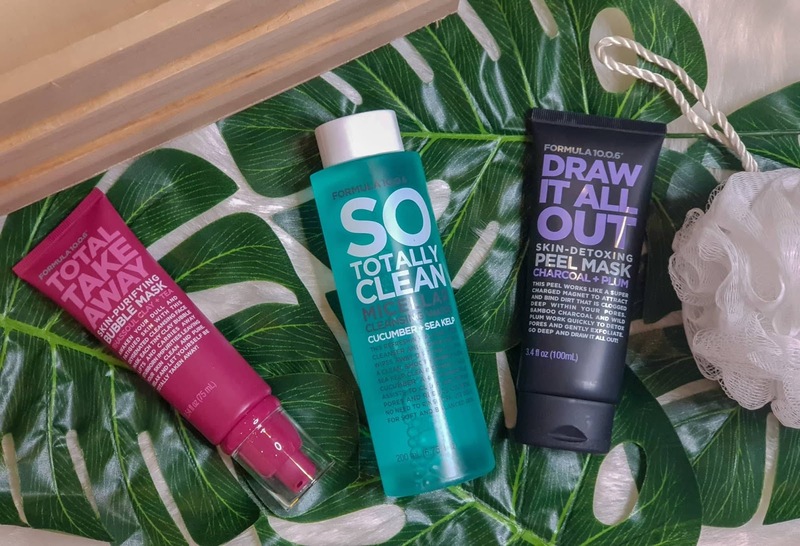 I love new skincare as much as I love chocolates and I never say no when I have a chance to review them which is why I was rather thrilled when I was selected to review this! The FORMULA 10.0.6 SKINCARE range. Formula 10.0.6 Skincare is an Australian Brand and It is said that the Formula 10.0.6 Skincare excels at perfecting our skin with a wide range of products that are specifically designed to promote clear and healthy skin. 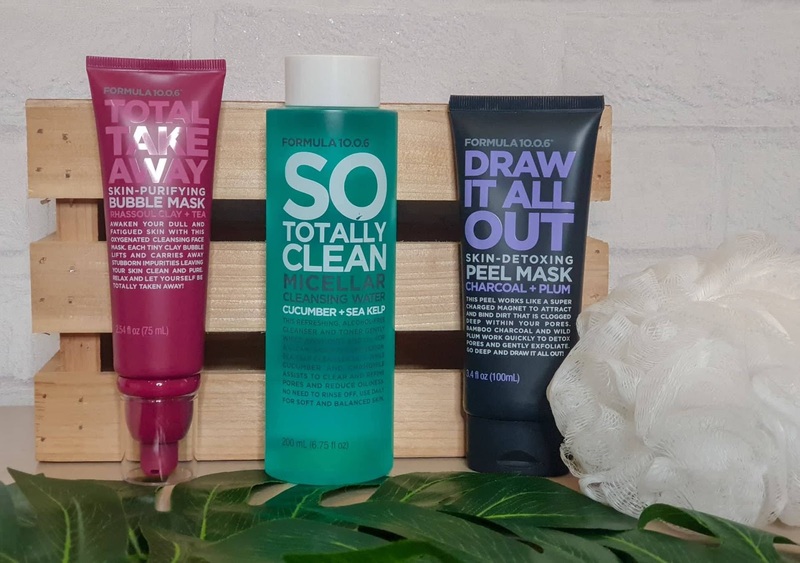 It was created by a chemist back in 1933, and now Formula 10.0.6 Skincare have products like cleansers and scrubs, Moisturizers, Treatments and of course Masks. Firstly I have to give them a thumbs up for the packaging. I love how they name their products and the design is so trendy with bold letters. This packaging will surely catch my eye in the stores. SO TOTALLY CLEAN Micellar Cleansing Water is a water-based solution that contains cucumber, sea kelp and chamomile. This product is alcohol free so there is no need to worry about it drying your skin. I personally try to avoid products that contain alcohol because I have rather dry skin and I find that products that contains alcohol dries them more causing minor breakouts. How to Use • Pour a 50 cent coin size onto your cotton pad and wipe over your face. Repeat with new cotton pads and until the cotton pad is clean. Sometimes when I am getting a little bit lazy, I just pour it into my palms and go over my face. My Experience• I noticed that my skin is shinier after about a week and definitely feels refreshed and cleaner after each use, they seem less oily too throughout the day. I also like the fact that this product doesn’t have a strong smell of cucumber since cucumber is one of its main ingredients. I am not a fan of vegetables, so I don’t really like anything that smells like it. Next is the TOTAL TAKE AWAY BUBBLE MASK which is their new product. Bubble Mask has been the in thing for quite sometime now. These bubble mask is applied on like regular cream and within seconds they magically start bubbling. They feel tingly and look funny. Insta Worthy most definitely but how do they actually benefit our skin? Well, these bubbling oxygenated mask is similar to carbonated soda water. Think Coke or Pepsi. These masks contains an ingredients called perfluorocarbons which dissolve oxygen gas like how water dissolves carbon dioxide gas to make soda. Oxygen gas is pumped into the liquid mas under pressure and them sealed into pressurized packaging [ if the mask is thick enough, pressure is not required] This explains why when you apply the mask in a thin layer the trapped oxygen slowly turns back into gas like bubbles escaping from a coke, however these doesn’t pop but forms a foam instead as Mask contains foaming ingredients. So, Formula 10.0.6 Total Take Away Bubble Mask contains Rhassoul Clay and it cleans your pores while the Green Tea acts as and antioxidant and these can awaken dull and tired skin. How to Use • Apply all over face and leave for 5 minutes and wash with warm water. Packaging • Comes in a 75ml Pump Bottle. Do note that it can be a little difficult to pump the first time due to the pressure in the tube. This bubble mask is not as thick as previous ones I have use which explains why It is pressurized. I prefer this compared to the thicker ones. My Experience • Cool huh? Well, I used bubbling mask 2 times a week just because I feel that it delivers extra oxygen to my skin - which is required for the production of collagen. I have also read that oxygen kill acne-causing bacteria, calms current breakout and stops future ones. I always feel that my skin is cleaner after a Oxygen Mask because they sees to be able to bubble their way into my pores and foam up pushing out dirt and stuff which is why my skin do appear brighter after each use. Another new product is the DRAW IT ALL OUT PEEL MASK which works like a magnet to attract and bind dirt that has been clogged deep within our pores. Bamboo Charcoal and wild plum works to quickly give your skin a detox session and gently exfoliates drawing out all the impurities. Ingredients such as Wild Plum fruit which is a mix of three different Australia plums helps to nourish, moisturize and invigorate your skin. How to Use • Apply all over face and leave for 15 minutes and peel off from the bottom up. Packaging • Comes in a 100ml tube which is easy to dispense, rather lightweight as it was really easy to apply. My Experience • It is really easy to apply and this mask left a silky smooth feeling, altho I don’t see much dirt. I am not sure if its because my skin is clean or they mask did not help in picking up dirt. The best part about this Peel Off mask was that there was totally no pain when peeling off. I am not sure if this is good, because maybe all those hard to peel off one's actually pulls out dirt but this was definitely painless to peel. If your would love to give these product a trial, you can get them at the places below!